The first time Neil mentioned an interest in raising meat chickens in our (suburban) backyard, I thought he was crazy. But he seemed so excited about it and made it sound so easy that I encouraged him to give it a try. He promised the “processing” wouldn’t happen at our house and the chickens would come back looking like they were from the supermarket. That was five years ago and we’ve raised them every year since. But what’s the appeal of backyard chickens? It’s a ton of fun. Hoards of neighborhood kids visit the adorable baby peeps each year. It’s become a tradition for our playgroup to come and hold the fluffy yellow chicks. Thus it’s a fun, free activity we can share with friends. It’s a great hobby. Everyone has hobbies. We like ours to be a.) inexpensive and b.) productive. So while there is some cost involved (see FAQ below), it’s money we’d have to spend on food anyway. 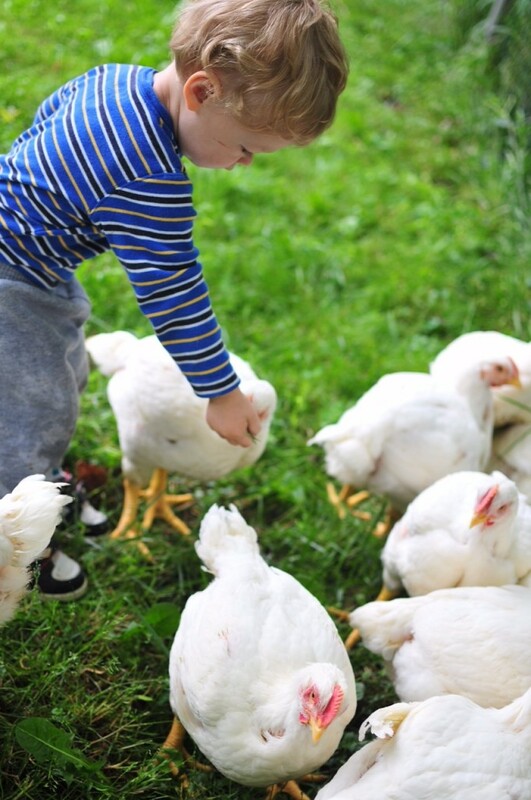 And rather than golfing, joining a pool, or taking up other costly summer pastimes, raising chickens is a kid-friendly, educational, natural activity that produces a useful and healthy commodity. Hobbies that produce rather than drain resources are another angle to increasing your usefulness instead of your lifestyle. It’s a learning experience for our kids. Our 3-year-old says “Cows give us milk. Chickens give us chicken.” Not only does see where his food comes from, he learns that this is normal, not gross. Feeding the chickens is his morning chore, from which he learns responsibility and maybe a little empathy, too. Every morning he whined that he didn’t feel like feeding the chickens. (And every morning I didn’t feel like finding everyone’s socks and shoes to get outside right away.) But I always told him they relied on him for food, and what if I didn’t feel like feeding him breakfast? “Then I’d be hungry,” he’d say, and out he’d go without further fight. Once outside he really enjoyed feeding them. His little sister even mimicked him by carrying tiny buckets of food to their feeder. So cute! Quality control. Knowing where our food comes from, what they’ve eaten, and how they’ve been treated is a real advantage. Like gardening or living like Grandma, it’s also a way of connecting with nature and how food was raised in the past. Once we found the shoes and got out the door, we all enjoyed being outside first thing in the morning. Doing faux-farm chores is therapeutic for suburb-dwellers like us. It’s a skill. Without being hard or technical, learning how to raise food is a useful skill to develop. Is it cheaper? 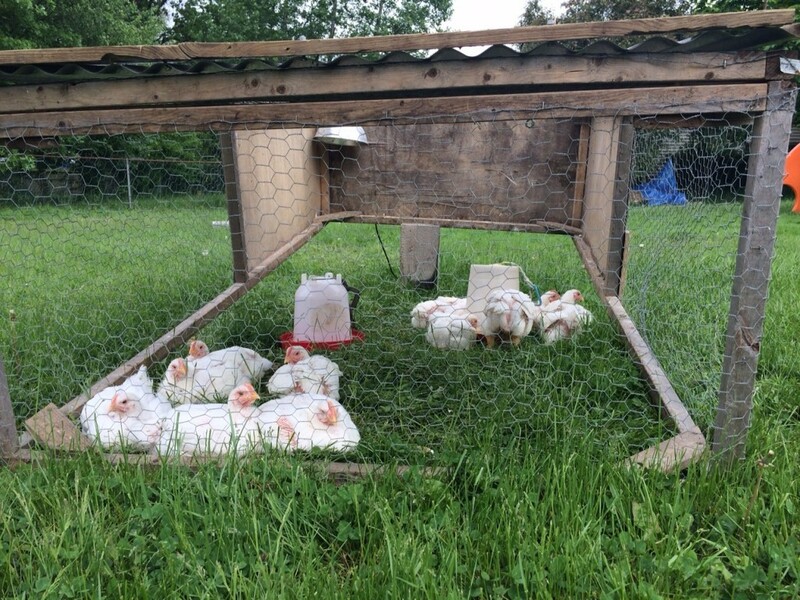 The start-up costs made the first year’s chickens some rather pricey poultry ($40 for the chicken tractor materials, $40 for water and food dispensers). Since then we’ve only purchased the chicks, food and vitamins, and a heat lamp bulb, bringing our total cost for 13 birds to $83, or $6.38 a piece. At around 6-7 pounds each they are cheaper than grocery store chicken, and much less than we’d pay for fresh, organic, responsibly raised meat. Do they taste better? It’s hard to compare to other fresh chicken since we never eat plain chicken. In my opinion they taste much better than frozen, solution-injected chicken. They are also more pleasant to cook with, as they lack the slimy feeling of typical supermarket poultry. How much care do they need? The chickens spend 2-3 weeks in our garage with a heat light. This is the brooder stage. Neil makes a pen out of a discarded box and fills the bottom with pine shavings. Then we transfer them to a box in the backyard called a chicken tractor, which protects them from raccoons and other predators. It has no floor, so the chickens get an all you can eat salad and bug bar every day. We replenish their food and water and move the box to fresh grass each day. Their life span is 6-8 weeks, and during the last couple weeks they need food, water, and a box move twice a day (3x for water when it’s hot). Chillin’ in the chicken tractor. How are they processed? TMI alert: don’t read if you don’t want to know! Neil takes them to a friend’s farm where they use the modern, humane method of bleeding them out before they are dipped in scalding water and plucked using a mechanical plucker. Then their organs, neck, and feet are removed, and Voila! They look like they came from the store. Is it legal? Our city allows all farm animals, and another family on our street has them, too. What type of box do they need? Neil built a 4’ x 8’ box out of 2” x 4” boards, reinforced in the corners with 1” x 3” boards, to keep it light and mobile without adding wheels. It’s constructed from the cheapest wood you can buy, and scraps. Fits no more than a baker’s dozen of birds. Do they smell? My baby’s poop smells way worse than theirs. I can’t detect the scent unless I’m moving the box, and it really isn’t offensive. And that’s coming from a super-smeller who can hardly stand Neil if he eats too much garlic. 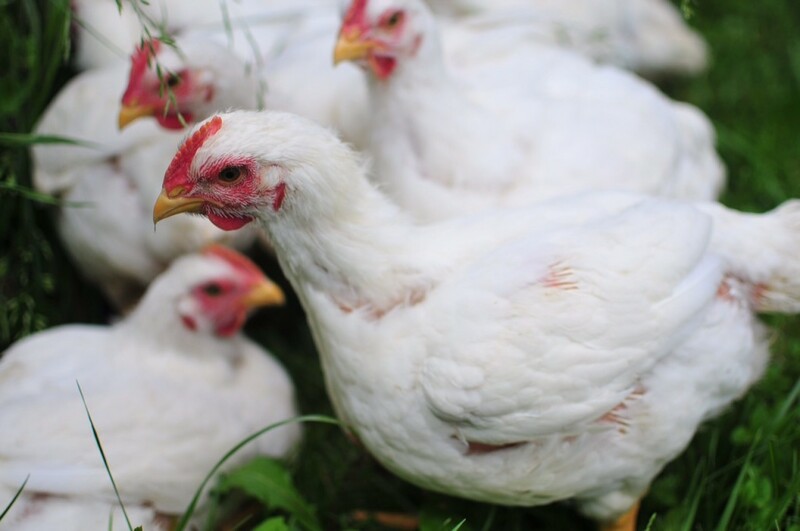 Would you consider raising backyard chickens? Any questions for us? I am vegan, so this isn’t really for me but I will say that I love it when people do this. It takes away money from those awful farms who seem to exist to torture poor animals. I have no problem with folks who choose to eat meat at all, so this is a great option and I’m glad you broke it down so people can see it’s doable – no matter where you live. Thanks for chiming in from a vegan perspective. Seeing the process of raising food, whether our chickens or our garden, has helped me understand some of the ways things can go wrong with the food we buy. It’s definitely made me a more informed shopper. If my city allowed it and I had a large enough yard I would seriously consider it. One thing I loathe about buying chicken is that I really don’t think they are raised humanely at chicken “farms” and I think having them under my watch would ensure that they would be raised ethically. Knowing they are raised properly is a bigger motivator for us than any savings. “Organic” chicken is crazy expensive and you still don’t know how they are treated. It doesn’t take a very big yard, but you do need some grass and the right city rules. Yep, *definitely* too chicken to do that. I’m too squeamish to eat (let alone kill) something I’ve fed and housed. But the meat you’re getting isn’t just better quality — it’s better for you. It’s not just antibiotics either. I found out that chicken has a painful amount of sodium. Apparently it’s injected to help the meat freeze better or look better or something. Blech. Raising chickens is definitely not for everyone, but it is fun to share about it. A recent news story also revealed a lot of U.S. chicken contains trace amounts of arsenic. We used to raise chickens before when my father was still alive. It’s really fun, especially when you saw the chickens continue to grow. It’s shocking how fast they grow! My wife and I have been considering this for a while! She had silky chickens until the neighbor’s dogs figured out about them…sad day. But we would like to actually raise chickens for more farming purposes. That is sad! Since you have some experience, you’ll probably find this method easy. Go for it!